After a few small projects, I have become infected with the woodworking bug. 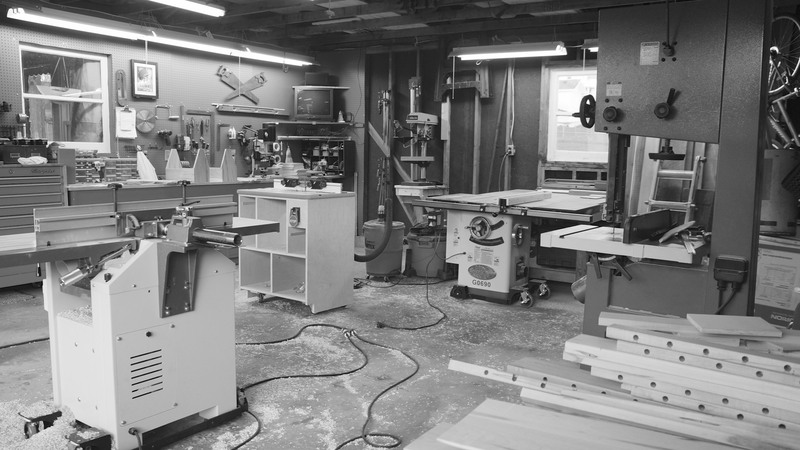 When I initially set up shop it was all about the power tools – that’s what we had in high school shop class, and it is what I thought a proper wood shop contained. 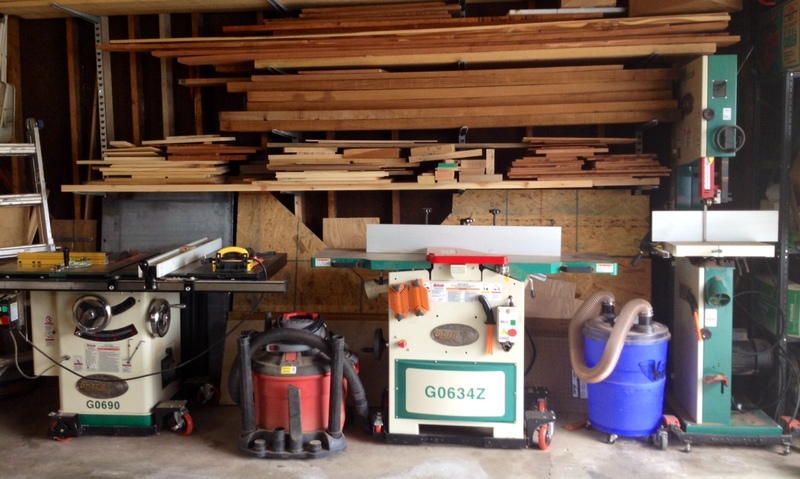 And when it came to power tools, I simply wanted to work wood – not hunt for equipment on Craig’s List or restore machinery – so I opted for new tools. Grizzly seemed to be the best bang for the buck, so I ultimately built up to some nice hardware from that purveyor. The big machines are on mobile bases, and are kept against the wall when not in use so that I could still park the cars in the garage. I am not going to scrape ice off a windshield if I can avoid it! I relied fully on power tools for those first projects, never giving any thought to hand tools. In my ignorant bliss hand tools seemed primitive and archaic, a hassle to maintain, and only used by fuddy duddy die hards – not something for a modern, efficient shop. So I tried to ignore every mention of them. 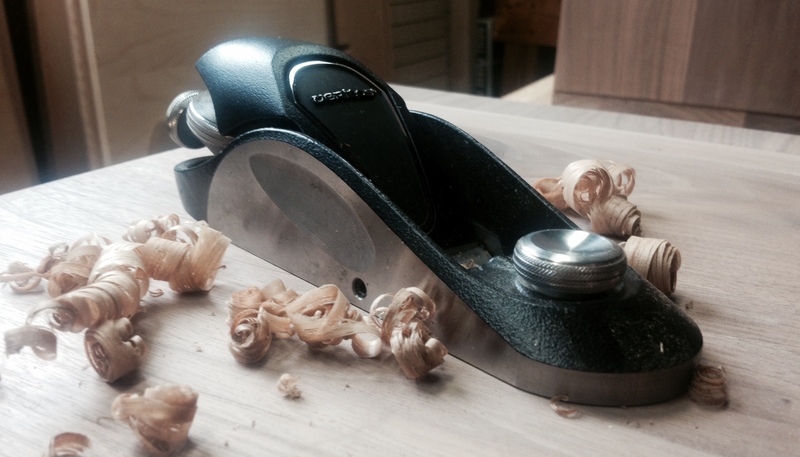 Then Fine Woodworking had an article on block planes, and the versatility they bring to a shop. The Veritas DX60 was highly recommended – and it’s neoteric lines caught my eye. It’s design reminded me of a Harley Davidson V Rod – a modern take on the classic form. I happened to be going to Toronto for a business trip a few weeks later, and with a Lee Valley store nearby I decided I would pick up one as a potentially functional souvenir. During the next project I encountered some burn marks on the edge of a board from the table saw. I had come to dread these burns – it took ages to sand them clean, and it often compromised the crisp square edges of the board. So I got out the block plane and started fiddling around with it. I truly didn’t know what I was doing, but after a while I finally got the blade set and took a pass along the edge. A thin curl of wood streamed from plane, and 90% of the burn marks were gone. Wow! After a second pass they were completely gone – leaving a smooth, crisp edge behind! I was so excited I brought the first couple shavings into Nicole, then started running the plane along every scrap piece of wood in the shop. It was addictive. Now that I was molding wood by hand, I was clearly a “real” woodworker. Actually, I disagree with the statement that only real woodworkers use hand tools, but I can’t deny that this was the feeling I got the first time I created shavings by hand!